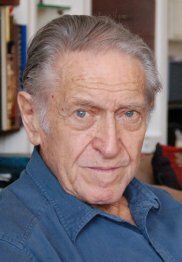 Leon Kirchner was born on January 24, 1919 of Russian parents in Brooklyn; grew up in Los Angeles; and studied with Arnold Schoenberg, Roger Sessions, and Ernest Bloch. Stylistically, Kirchner remained remarkably individual; earlier influences of Hindemith, Bartók, and Stravinsky soon yielded to a wholehearted identification with the aesthetics, if not necessarily the specific procedures, of Schoenberg, Berg, and Webern. Extraordinarily gifted as both a pianist and a conductor, Kirchner was first and foremost a composer. A member of the American Academies of Arts and Letters and of Arts and Sciences, he was honored twice by the New York Music Critics' Circle (String Quartets Nos. 1 and 2), and received the Naumburg Award (Piano Concerto No. 1), the Pulitzer Prize (String Quartet No. 3), the Friedheim Award (Music for Cello and Orchestra); and commissions from, among others, the Ford, Fromm, and Koussevitzky Foundations; the New York Philharmonic, The Philadelphia Orchestra, the St. Paul Chamber Orchestra, the Spoleto and Santa Fe Chamber Music Festivals, the Boston Symphony Orchestra, The Chamber Music Society of Lincoln Center, and Elizabeth Sprague Coolidge. He was composer-in-residence and a performer at the Santa Fe Chamber Music Festival, the Tanglewood Music Center, Tokyo Music Today (Takemitsu Festival), and the Spoleto (Charleston), Aldeburgh, and Marlboro Music Festivals. He also conducted at a number of leading music festivals around the world, most recently at Ravinia. He taught for many years at Harvard University. Kirchner's last works include The Forbidden, for James Levine and the Boston Symphony Orchestra; Music for Cello and Orchestra, for Yo-Yo Ma and the Philadelphia Orchestra (recorded on Sony Classical); Trio No. 2 for the Kalichstein-Laredo-Robinson Trio; Of Things Exactly as They Are, a work for orchestra, chorus, and soloists for the Boston Symphony Orchestra; and String Quartet No. 4 for the Orion Quartet. Following their premiere of String Quartet No. 4, the Orion Quartet recorded Kirchner's complete quartets — works which span a 57-year period — for Albany Records. Performers who championed Kirchner's work include Yo-Yo Ma, who toured and recorded both Music for Cello and Orchestra and Triptych for Sony; The Chamber Music Society of Lincoln Center; Continuum; pianists Peter Serkin, who commissioned and recorded Interlude (BMG), and Leon Fleisher; cellist Carter Brey; flutist Paula Robison; conductors Oliver Knussen, Hugh Wolff, and John Adams; and the trios of Kalichstein-Laredo-Robinson and Buswell-Parnas-Luvisi. Other recordings include his first three string quartets (Boston Composers String Quartet, Albany) and Nonesuch's all-Kirchner recording which includes the Concerto for Violoncello, Ten Winds, and Percussion; the Piano Trio; Five Piano Pieces; and Music for Twelve, featuring the Boston Symphony Chamber Players. Of Music for Twelve, Allan Kozinn of The New York Times wrote: "There is magic in the interplay between the 12 soloistic lines, and in the way instrumental colors seem to grow from each other to form lengthy melodies." Leon Kirchner's music is published exclusively by Associated Music Publishers.